As the Issue 14: Architect update for City of Heroes draws closer to release, NCsoft drops new information and screenshots explaining how players will go about adding their own original content to the game. The Mission Architect for City of Heroes and City of Villains actually appears in game within buildings belonging to Architect Entertainment, a company that has developed a virtual training program for super-powered beings. Players will log in to a computer terminal in said buildings to gain access to the mission editor, where they can create anything from a quick mission that lasts a few minutes to a massive, five-chapter epic. Players write the dialogue, create the enemies, and map out the goals other players need to achieve to complete their mission. Once they've got it perfect, they can upload it to NCsoft's Arc Server, which delivers their content to all of the game servers. Once it's live, anyone can access the terminals in Architect Entertainment and run through the mission. NCsoft actually sent along a helpful FAQ with all of these details and more, which we've posted below for your perusal, along with screenshots of Architect Entertainment and the editor in action. What happens next is up completely up to the players, but it could be the start of something pretty damn amazing. For those of you interested in checking out what the players create once Issue 14: Architect goes live, look for the City of Heroes: Architect Edition, the game's first dual PC and Mac release, on store shelves this April. 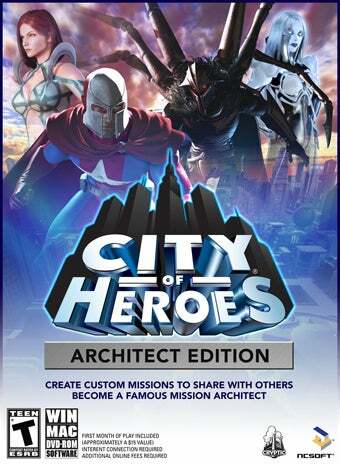 a.Mission Architect is a new game system we have developed for the City of Heroes massively multiplayer game. It allows our players to create their own stories and share those stories with other players on our live servers. Creators can pick from hundreds of maps and thousands of characters. They can use existing characters or create their own custom enemies. They can get even more detailed and create full enemy groups, giving each enemy unique costumes and powers. We allow players to write all of the dialog for their story as well as decide on level of difficulty and enemy placement. We even give them the ability to trigger one mission goal off of another, creating a chain of events within a single mission. Each story can have up to five chapters or missions and each mission can hold up to a maximum of 25 achievable goals. For people who just want to play the user created content, we give them access to the mission browser that shows all the generated content. You can sort these stories by name, highest rated, length and recently added. You can also filter content to show only those with specific ratings, arcs you have or haven't played as well as the alignment of the story. As people play content, they'll be able to rate that content from one to five stars. Creators will actually get in game benefits for making content that gets highly rated. We even offer a Dev Choice and Hall of Fame standing for the best of the best. a.Players create content in game through a computer terminal within one of the Architect Entertainment buildings. Architect Entertainment is the name of an in-game company that's developed this type of ‘simulated experience' for heroes and villains of Paragon City and the Rogue Isles. You can think of this like a holo-deck or a simulated mission tool. Players go to these facilities that are spread through out most of our zones and interact with a computer that walks through the creation process. Here is where they pick all of their options for a mission as well as write all the dialog and build their custom characters. Once they've gotten their story together, they can test it out and see how it plays. Once they've gotten it perfect, they can publish the story up to our Arc Server. This server is cross shard and cross game. So, any content published will be seen by everyone on every server, regardless of where they play. 3.What rewards are we giving to the players and creators? a.We're granting full experience (XP) and influence rewards for defeating enemies in player made content. We're also giving players tickets in place of random drops. They can take these tickets to an Architect ticket vendor and redeem them for various in game rewards, such as enhancements, recipes and salvage. We're also allowing players to purchase unlockable content with their tickets. They'll be able to get maps, costume pieces and different characters. 4.What special features does Mission Architect have? a.At the high level we allow you to create your own stories and share them with others in the game. b.You can build your own custom characters as well as full enemy groups, giving each one a unique costume, powers, name and background. c.We allow players to link mission goals together, creating a chain of events in a single mission. d.We offer rewards for the players who develop well received content (Hall of Fame and Dev Choice). e.Every published story is visible to each and every one of our players. 5.Can you talk more about Dev Choice vs. Hall of Fame? a.The Hall of Fame is where the best player rated content goes. To get to this rank you need to have over a 1000 votes with an average of 5 stars (we round up). Getting into the Hall of Fame changes your standing in the mission browser, moving it further up the cue. b.Becoming a Dev Choice story happens when one of us (the developers) sees content that we feel best represents what Architect can be, good story and fun gameplay. Getting into Dev Choice actually elevates you beyond Hall of Fame and gives your mission the same sort of rewards and drops you would get outside of Architect. The only difference being that you get a ticket bonus at the end of a mission as opposed to an experience bonus. c.We also have a third tier of stories which we will talk about at a later date. 6.How are you dealing with inappropriate content? a.We've worked very closely with our customer service department to develop systems for this. In the end, we implemented a number of different systems. We have language filters that check for bad words and won't let you publish them until you remove them. We're also allowing players to flag content for inappropriateness. We also track all users and flags for any potential vote griefing. 7.What's appealing to the players of user generated content? a.We're creating a system where the best content rises to the top of the list and everything else is filtered to the bottom. Players can sort by rank as well as what they have and haven't played. When playing in someone else's content you'll continue to earn full XP and influence. We've replaced the random drop system with a ticketing system. Players collect tickets as they go through content. Once they've collected enough tickets they can go to a ticket vendor and purchase exactly what they want as far as rewards go. 8.How long does it take to make a decent five mission storyarc? a.You can create a single mission rather quickly, in less then ten or fifteen minutes. However, to truly craft something unique and excellent, you'll have to spend a decent amount of time in the tool. It could take someone a couple of days of to write, build and test something really good.